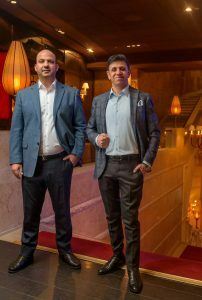 Owners and CEOs of Mellow Mood Hotels, Mr. Sameer Hamdan and Mr. Zuhair Awad were selected among the 50 most influential persons in the Hungarian tourism industry, for the fifth year in a row. On 1st February, 2018 at the 26th Season Opening Tourism Gala and Award Ceremony, Tourism Ltd. presented its well known publication, in which the jury of professional organisations voted again for the most influential persons in the domestic tourism sector, based on their professional work. During the selection process not only the size and revenues of the companies were taken into consideration, but also their influence on the tourism sector and their foreign and domestic reputation. More than 20 years ago, owners and CEOs of the most dynamically developing hotel group of the last decade, Mr. Sameer Hamdan and Mr. Zuhair Awad arrived to Hungary as students. Now, Mellow Mood Hotels has 12 hotels in Budapest, the company managed several real estate projects, the hotels and the CEOs gained several domestic and international awards. For their achivements, today they are known as prominent members and among the most influential persons of the Hungarian tourism industry. The past years for Mellow Mood Hotels were not only about the growth and stabilization, but also about the planning and preparation for the upcoming new development. The hotel chain will restore another emblematic building to its original beauty and open the Párisi Udvar in 2019 as a new 5 star hotel, member of the „Unbound Colletion by Hyatt.